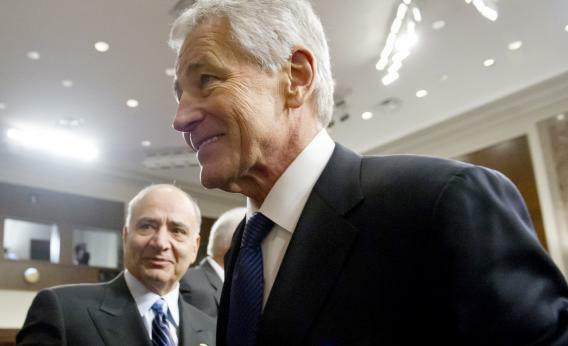 Is the Hagel Confirmation Basically a Done Deal? Former US Senator Chuck Hagel, US President Barack Obama’s nominee for Secretary of Defense, leaves during a recess in testimony during his confirmation hearing before the Senate Armed Services Committee on Capitol Hill in Washington, DC, on January 31, 2013. It took a while, but media on the Chuck Hagel beat finally started asking skeptical Republicans the right follow-up question. Right, right, they have serious, gut-deep doubts about Hagel running the Pentagon. But will they filibuster him? Yesterday, the “maybe we won’t filibuster him” caucus got large enough to effectively confirm Hagel. In a story about Mitch McConnell raising the possibility of a filibuster, Fox News also cites Richard Burr as a filibuster skeptic and Lindsey Graham as a reluctant filibuster-er. (Graham, in the past, has talked loudly of his doubts about nominees, then voted for them. See “Sotomayor, Sonia.”) But let’s add their voices to those of Thad Cochran and Mike Johanns (who has Hagel’s old seat), who have said they’ll provide “ayes” for the nomination. You’ve got between 60 and 62 votes for cloture on Hagel, even if you’ve got a final Hagel confirmation vote of 57-43. The failure of anti-Hagelians to pull off any Democrats is effectively sinking their campaign. But it’s been a remarkably effective campaign, aided strongly by Hagel’s own incompetence.